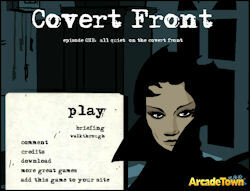 This is a walkthru guide for Covert Front Episode 1, a point-and-click mystery adventure game that will transport you to the center of an espionage-filled world. Go right at the door, find the garden hose hidden under the bushes. Click on the wooden box in the distance, then get the garden scissors from inside the box. Go left at the door, zoom in on the electric box hidden in the bushes, use garden scissors to snip the wires. Enter the house by clicking on the handle of the front door. Go through first door on the left, you're in the kitchen. Get matches from the fireplace, then open middle drawer beneath the table. Zoom in on the drawer, get the ice pick. Zoom out. Go right into the dining room. Zoom in on the clock, set it to 2:35 (the time you see on the clock in the hallway painting), then get the clock key. Go into the hall, zoom in on the small door beneath the stairs. Use the ice pick on the lock then click the door handle to open the door. Enter the storage room, get the crowbar. Go out of the house, then go to the left. Zoom in on the small wall in the distance. Use the crowbar on the sewer grate. Climb down, then turn the valve. Go back to the kitchen (first door on the left). On the lower left wall there is a passage to the basement. In the basement turn on the light (top button near the right side of the screen), attach the garden hose to the pump, then turn it on (switch at lower right side of screen). As the water disappears, take the library key that appears on the lower left of the screen. Go back to the main hall and then go upstairs. Enter the bedroom - first door on the left. Zoom in on the night table behind the bed (click on the pillow to get here), then get the book. Go out to the hall. Use the library key on the closed library door (door on the right side of the screen). Go inside. Put the book on the lowest shelf, near the window. Then pull out only two books from the bookshelf - the ones with an eagle on them (one on the top shelf, one on the second shelf from the bottom). Enter the secret room. Get the unrecognized item floating on the column towards the right of the screen. Then click the table at the bottom left corner and collect the plans. Then go back to thefull-room view. Zoom on the closed cabinet next to the doorway, then use the clock key to open it. Get the signet ring. Go back to the ground floor, and stand in front of the professor's portrait. To the left of it there is a lock on the wall. Zoom in and use the signet ring on it. Go into the secret room and down the ladder to the secret laboratory room. Use matches on the lamp (bottom left of screen) so you can see. Collect the fuse (bottom center of screen). Go right twice. Put the fuse on the fuse-slot (bottom center of screen), then turn the machine on by pressing the button beneath the two dials. After the alarm sounds, go right and use the crowbar on the metal bars. Enter this new passage. Click on the dark passageway towards the left side of the screen. Use matches to illuminate the darkness.